Hope's Cafe: Rest This Summer With SilkSleep! How many of you have trouble sleeping in the summer? We usually keep our A/C cranked to about 68, but every once in a while you just toss and turn, trying to find a cooler area of the bed. I currently have satin sheets, but I've recently been thinking about changing these in for something even better-silk. How awesome does that sound?! Imagine sleeping in silk every night? That would be sure to keep you cooler. I recently had the opportunity to try a little bit of silk luxury, when SilkSleep sent me a Silk Eye Mask. SilkSleep carries an entire line of silk bedding; from silk duvets to silk gowns, and I was excited to try out this mask. The Silk Eye Mask has multiple benefits. Obviously, eye masks are great for keeping light out so you can get a good night's sleep. I don't know why I haven't tried one before, because I seriously can not sleep if there is even a little bit of light shining in the room. Whether it's the bathroom door that got left open, or a laptop being used, if there is light-I can't sleep. 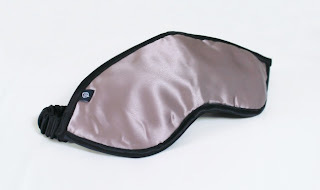 So needless to say, this eye mask has been a great benefit, and gets used every night! However, this is more than just your ordinary eye mask. The silk makes it very soft and comfortable against your skin. No itching or irritating, just soft, cool comfort. An additional benefit is that the silk material helps keep the eye area moisturized, which prevents lines around the eye! Check out SilkSleep for any silk bedding needs, or follow SilkSleep on Facebook to stay updated on any news and special sales!